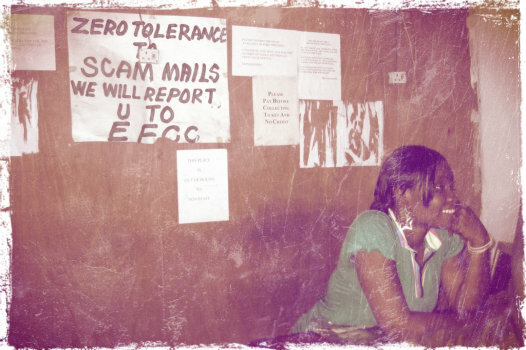 obscene chewing: nigerian pen pal. I don't know why I respond to these emails—when clearly nobody will ever read them. Here's the original email I received. You've seen many like it, so I don't suggest you read it in its entirety, unless you hate your own guts. Honestly after a serious thought, I have decided to personally reach you directly because I do not have anything against you, but your so called representatives working with you to realize the remittance of your payment. However, have you ever wondered why you have been going this vicious circle over the past years with respect to having your fund paid to you without any success? It is possible that you were informed that your payment was brought to me for finalization, neither were you informed that I am the person frustrating every move to get your fund remitted to your local bank account in your country, I can assure you that this yetanother deceit on the part of your representative(s).Well, like I said earlier to you, I have nothing against you or your payment but I’m only trying to protect my interest also. I do not want to mention names here, but am certain you are aware of whom I am referring to having not received your fund. I am the Director, International Wire Transfer/Telex Department,Central Bank of Nigeria, the apex bank in Nigeria. Some time in the past a representative of yours approached me through a friend of mine who works with one of the Government Ministries here and requested that I assist him conclude a money transfer deal having you as the beneficiary and we all agreed.According to him, he wanted to use this strategy to transfer a huge amount of US Dollars by presenting your name as“Beneficiary” whose fund has not been paid. Although we agreed that once I did that, he would give me 20% of the total fund and he will equally give me your contact information before I release the fund to your account. When he saw that I have programmed your fund for onward transfer and your name has been approved among the list of those to be paid as instead of him letting me have your contact information to enable me regulate the transfer of funds and confirm when it arrive in your account to enable me send to you my private account details for my share of the 20% as was agreed previously, what he does was to start avoiding me and which thereafter,resorted to threats,because of that,I immediately deleted your payment initializing code (PIC) from the list of those to be paid, and this made it very IMPOSSIBLE for the transfer to be completed to your account. did not reveal the payment initi untrusted representative. AND AGAIN BEAR IN MIND YOUR PAYMENT IS NOT IN ANY OFFSHORE PAYMENT CENTER FOR NOW and YOU WILL NEVER RECEIVE YOUR PAYMENT FROM ANY OFFSHORE CENTERS FOR NOW AS FOLLOWS LONDON, SPAIN, HOLLAND, DUBAI, not even the United States of America or anywhere outside Nigeria BECAUSE THAT IS WHAT THEY MAY HAVE TOLD YOU. Now if you want us (you & I) to work together for me to conclude the remittance to your account, these are my conditions. (I). You must keep my information to you in this correspondence highly secret because I don't want to get involve with he,your local representative again in my life and I will have 10% of the money if successfully transfere to your local bank account because it is only two of us in connection to logical remittance of the fund to you. (ii). You MUST assure me that you will not betray me at last and my own share will be safe until when I will redirect you to lodged my part of the fund into an account that i will forward to you. (iii) As you have seen, it will be useless and mere waste of money if you continue with your local representative and i can assure you that with trust and confidence we will conclude the transaction with utmost secrecy and confidentiality if you wish to adhere to my directives and instructions. If these conditions are acceptable to you, contact me as soon as possible to let us finalize all the arrangement and conclude the remittance of the fund to you immediately without any other delay attached. I will give you more important details once I hear from you based on if you promise to keep away from your local representative and handle this matter with utmost confidentiality because I want to transfer the money without the knowledge of any other officer of the bank or even without the knowledge of your local representative . May the peace of our Jesus Christ be upon you. I can send you a loaf of my feces in folded waxed papers. It makes clean trowels but owing to the fine leathery graft, I have been unable to disassemble my scrotum in the time allotted by the SDC (Scrotum Disassembly Council). Jesus's elf named Quentin who lives in the onion basket just outside of my brain said to me when he spoke, 'Do not mail hypochondriac violets to your local representative. He will know that there are monies and angry cheese wheels in Nigeria for you to be purloined by malfeasants and bird-fingered agents of doom.' Quentin--he is not only an elf with clotted spangles, but an elf among them on the topmost shelf of where Jesus seeks to place them when he is in an elf-placing mood, which is on Thursdays usually cattle stowing days. If he were lower than spindles or grass beams, I'd say never, you see, but his shelf is uppermost, as I've read on teletype transmissions to my randomly placed receptors. (Do not look for my receptors. They are thoroughly disguised as very wooden air.) Height demands upon me certain conditions, certain ethical obligations. When there are local representatives with blandishments whittling in my anteroom I am dutybound to harpoon them, such as Jesus performs granular art--painted sand--dollops of ejaculate in my moon room. Put on your transmissions: THIS IS FOR ALL THINGS BUT ELVES AND TIMBER! They are obliged by the font to run from the paper at fast heels. This is a hint to the place I keep my spare urination tubes. Which Burn at Our Emission Holes. Please start to quit impersonating me! I visite your profile and I find out that you are the type that suit my heart, which am seeking for, I hope and believe we will walk it out for heart desier, let come out for something good for our love, i believe someone with good zeal, someone who knows what is love and you are the type, when replying contact me through my e-mail adddress. (ka_tou206@yahoo.co.in) Iam waiting for the love. I am Montambeau, by the way. I don't know why my picture from my google account doesn't show up. Montambeau! I hope you responded to Kathrin! What fun you could have! Please begin a correspondence and send me a transcript. Iam ariel. Iam waiting for the love.